On Thursday night, while waiting with Sancho, the vet said something useful and comforting. He said that I shouldn't feel bad about my grief over Sancho. The pain of parting was just a last validation that I had loved and cared for him as I should have. I need to remember to breathe joy, not anticipate sorrow. I've got two more geriatric goats and a sixteen-year-old Shan-cat who still delight my days. And there are more animals growing old behind them. Night will come for each of us, but not just yet. I'm so sorry to hear about Sancho. I share in your trepidation. I always have a bit of worry in the back of my head hmmm going to come home find something terrible has happened to Alex. To the best of my knowledge he's perfectly healthy, but he is at least twelve and it doesn't stop the worrying. I've had a number of pets die, to varying degrees of grief. It doesn't stop me from worrying, but I know that I will get past it eventually. 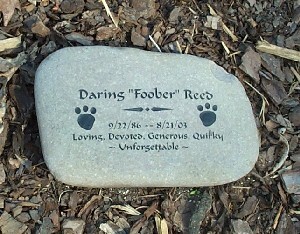 One of the ways I best processed my grief was getting a headstone for Foober. I worked long and hard to distill down a lifetime (grade school to moving out to this house) of companionship onto a rock that I know will outlast me. That thought exercise helped me celebrate her in all of her cookie-eating, fetch/playing, driver-supervising ways. Summarizing a life well lived and well loved into basically one sentence takes a lot of time, sometimes, and it is spent remembering and reliving all the good and bad. So now I try to do that for all of the animals for which I had some kind of affection or connection. I'm a little behind in actually ordering headstones due to making the line art, but I know what the stones will say.